Home / To Catch A Fish! The Wild Salmon Mystery Class is now finished and I love the way this canvas came to life. I had a few surprises for you on this one…. You saw the first fish in lesson two. Now there are two more completed. 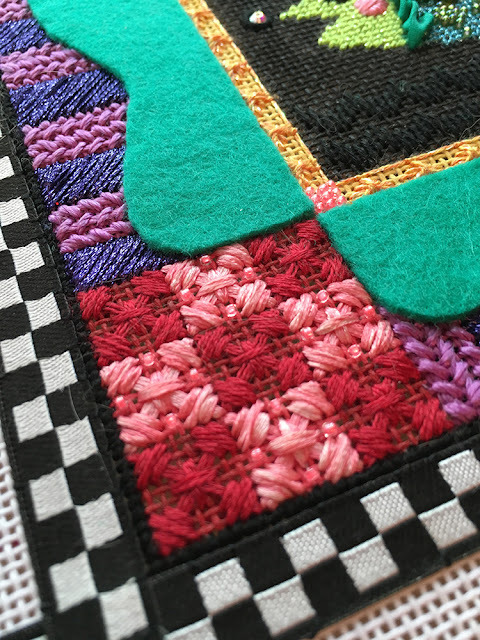 They all use essentially the same stitches but with a few twists. The big side fins on both fish are just buttonhole stitches worked with 7mm ribbon. 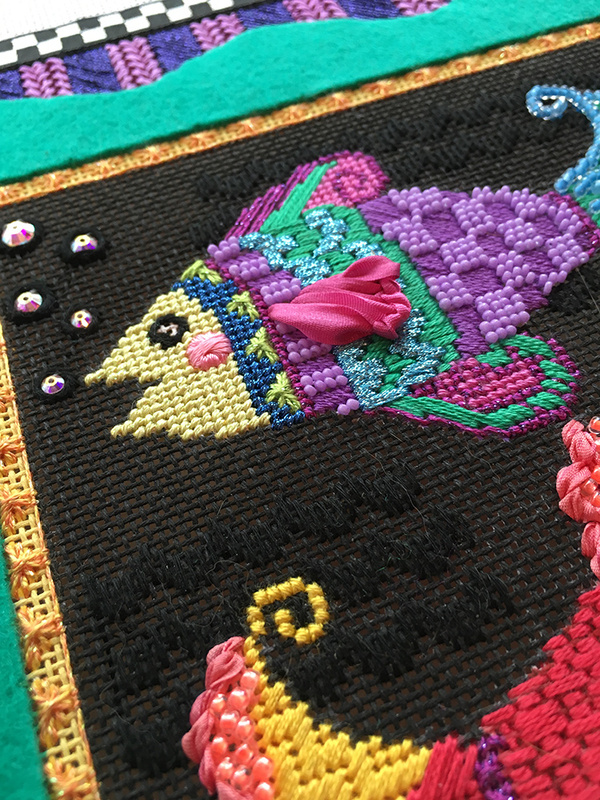 For the bottom fish all stitches pretty much shared a common hole where the needle sinks in to the canvas. 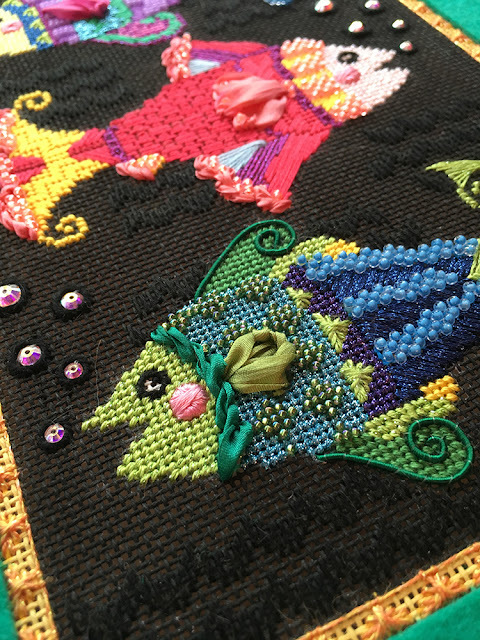 For the top fish the buttonhole stitch starts at the top of the fin with a short stitch and works around the curve with no shared holes and each stitch getting longer as you follow the curve. Pretty cool! One stitch same thread but two totally different looks! You know I love beads, I’ve always loved beads. I’ve couched rows of beads before and I’ve done beaded backstitch before, but……. thanks to Kinga Nichols coming to teach I have now improved my technique! The tail on the top fish is embellished with rows of beaded backstitch! Woo Hoo! 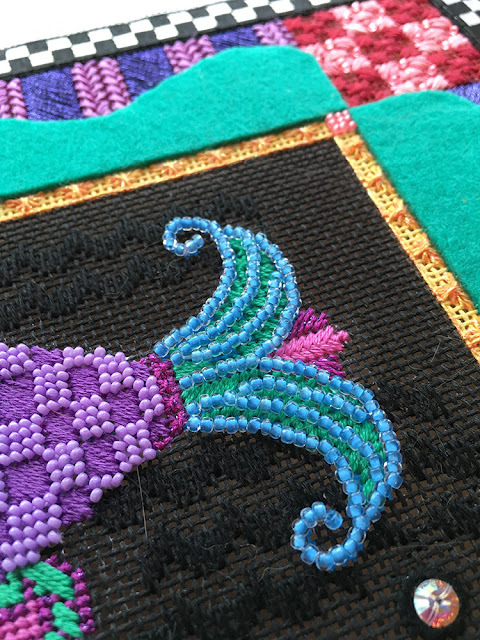 The final touch is the big teal border. Hmmm, what to do? I really didn’t want any texture, just super smooth. I could have Tent Stitched it and that would work but the curves wouldn’t be as smooth as I would like and it wouldn’t be as smooth as I would like so…… Applique to the rescue. Beautiful green felt is appliqued to the canvas with tiny stitches. It goes fast and gave me the look I wanted. Win. Win. It’s off for finishing now. We have canvases in stock if you would like to order a kit. Just give us a call and we’ll make it happen. Next up is Run Bunny Run by Zecca and Row of Ladies II. Let’s see where those two projects go. « Previous: Now is your chance!